Egress Group | Accessible Exit Sign Solutions. The use of the ‘Accessible Means of Egress Icon’ within signage strategies provides a clear, pictorial message for occupants, to identify those exits that are accessible, and those which are not accessible. A gap exists in the most countries legislation relating to the evacuation of people with disability under disability discrimination, building and workplace safety laws. The gap exposes those members of the community with a disability, particularly those with sensory or mobility disabilities to the risk of being delayed in their ability to evacuate a building or being entrapped within a building that has been evacuated. The provision of enhanced exit signage within a building, that adopts a strategy to help occupants identify accessible paths and accessible exits must be considered in the future. This has to be considered as a critical part of the solution to fill the gap. The current situation presents a risk for occupants and a risk for building owners and managers. The needs of all occupants must be considered in the future in terms of exit signs. At Egress Group we believe the future in exit signs must include the ability for occupants to identify the accessible means of egress. To do this, appropriate exit signage is required. The use of the ‘Accessible Means of Egress Icon’ within this signage strategy will provide a clear, pictorial message for occupants, to identify those exits that are accessible, and those which are not accessible. 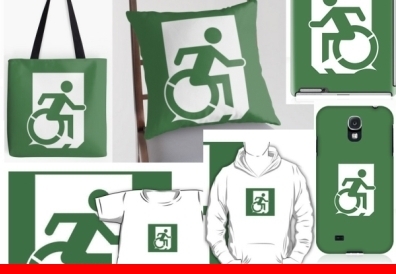 This concept is not new and the International Standard on Accessibility (ISO 21542) presents an idea in Figure 72 of the Standard, this Figure shows the Running Man with the International Symbol of Accessibility. We believe this approach is confusing and nor clear. The use of the International Symbol of Accessibility has been used for over four decades for accessible toilets, parking and entrances, but the symbol should not be used for exits. The use of the ‘Accessible Means of Egress Icon’ is a new approach to the concept. It is also clear and obviously shows a person moving quickly to an exit.